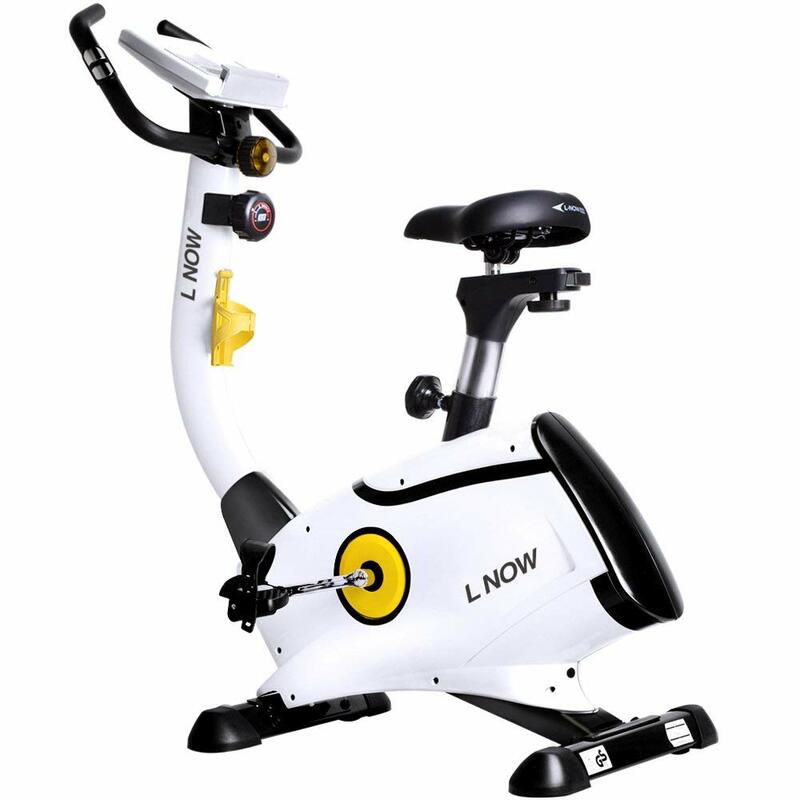 L NOW D808 is an indoor upright stationary exercise bike with magnetic resistance and belt drive system and a 8.9 lb. flywheel. 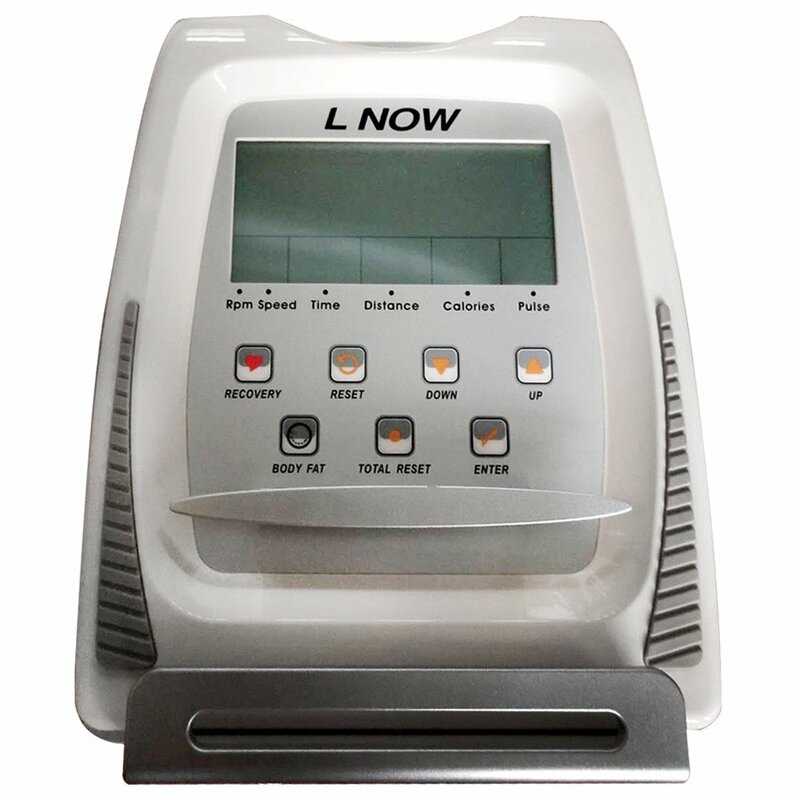 It works very smoothly and quietly at all times. It is rated 4.8 out of 5 stars by 56 customers at the time of this product review. And this is obviously a very high customer satisfaction score. White L Now D808 weighs 66.2 pounds and measures 50.4W x 57.3H x 21.6D inches. With a robust steel frame it can carry up to 300 pounds of user weight. It has a unique fashionable design and looks great in white. And despite not having a foldable design it can be moved on its transport wheels. You’ll be better off using it on hard flat floors so it stays put and stable but is OK on carpet too. If you’re putting it on a carpet it is best you use an exercise mat underneath to protect your carpet. You’ll find pulse sensors on the handles to measure your heasrt rate. And you have the usual indicators of distance, calories, speed, time and rpm. With the 8 levels of magnetic resistance you can adjust it for an easier or more challenging workout. It has the Recovery, Reset, Up, Down, Body Fat, Total Reset and Enter. The seat and the handles are both adjustable: Seat four ways (up, down, forward and back) and the handles can be rotated to accommodate users of different heights. Very short and very tall people can use it comfortably as the seat and the handles are adjustable. There is a metal bottle holder in the middle so you don’t have to dismount the bike to get water and you can stay hydrated during your session. The handles are comfortable to hold and offers support especially when you’re standing. With the accurate indicators on the display panel you will stay motivated and achieve results quicker. It is a fairly large display and the numbers are definitely easier to read than on the standard small screens. You can put your tablet, iPad or smartphone on the holder and stay distracted with the entertainment, go for longer and burn more calories. You won’t get the water bottle or the tablet in the box. It comes with sturdy pedals that are both safe and comfortable. Your feet will no slip and you’ll feel the support when you’re pedaling. It is not hard to set up with the user manual and the hardware included in the box. You’ll find a foot leveler on each corner to fit the uneven floors. The base is very large and the build quality is very good overall. You can feel totally safe and stable on this bike. You can stop this bike instantly and quietly (without any noise) by pressing the adjustor. There is no Bluetooth functionality on this bike and you can’t really transfer your stats to your smartphone. This is a belt driven bike (connection between the pedals and the flywheel), not a chain driven one. Hence it is quieter and smoother and costs more than chain-drive. And for resistance it has magnetic vs the wool pad/rubber pad rubbing against the flywheel and that needs to be replaced. The seat is also very good quality and comfortable, similar to the expensive replacement saddles. It is nowhere as hard as a standard spinner bike seat. It is well constructed, has great ergonomics, runs smoothly and quietly, is modern and user-friendly. For the price level it is one of the best value bikes out there. The company offers decent customer support when you have questions or need assistance with anything.